Dillon sent me his poems and asked me to share them with my readers. For such a young man, they're deep. I really like Memories. I wish him much success. Read his autobiography after the jump. Caught within the spider’s web, no protection! Battered and abused, wont you show her that you care ? Born on the morning of January 26th 1989, at the Kingstown General Hospital in St.Vincent. 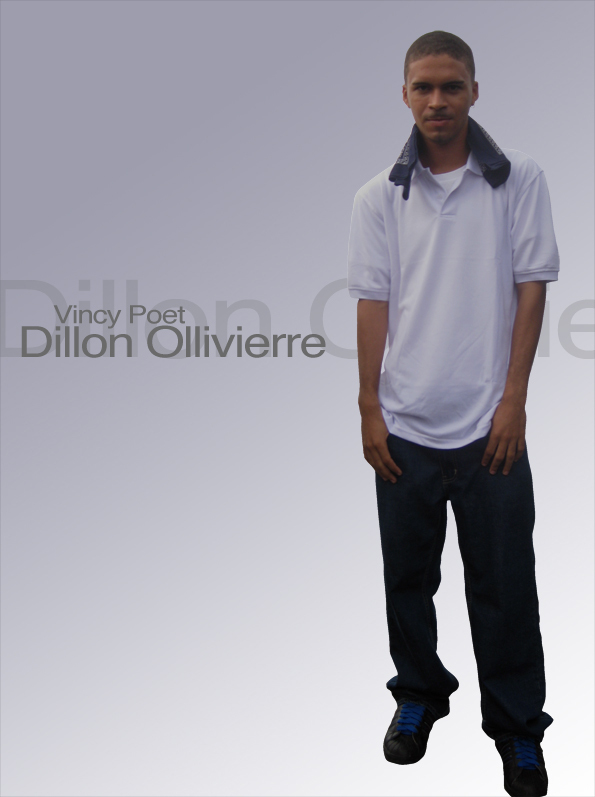 I am Dillon Ollivierre. I am the only child for my parents Lucien and Verina Ollivierre and I reside at Friendship , Bequia. I first entered the Bequia Seventh Day Adventist Primary School at the age of 4 and graduated in the year 2000. I later I went on to the Bequia Seventh Day Adventist Secondary School and graduated in the year 2006. While attending that institution, I was a young leader and I took a course in adolescent growth and development which was offered by the Health Education Unit of the Ministry of Health. At present I am completing my two year course in electrical engineering at the St.Vincent & The Grenadines Community College: Division of Technical and Vocational Education. I've been writing poems for about 6 years now. I was inspired by a few singers and their lyrics, by love and also by close friends and family who motivated and encouraged me through the good and bad times. The first poem I attempted to write was to express my love for a girl but my attempts were all in vain for it did not sound the way I wanted it to; but nevertheless I strived for excellence until it was achieved. Since then I have written more poems, some of which I published in the local newspaper and various internet sites. Among my posts online, was a a tribute to Michael Jackson when he passed away and also a tribute to Haiti after the earthquake, which was written to remind people of the need to still assist the country.Some of my latest poems have been posted on my Facebook page while many others have not yet been revealed to anyone because I'm putting together some poems which would go towards a book. I am hoping that i would attain sponsorship to make the idea of publishing a book of my poetry a possibility. To me life is a blessing, it is a chance or privilege given to us to obtain the best out of it and to achieve and contribute to making the world a better place and further more to serve the Almighty for giving us life and a chance to make it into his kingdom. In the future I aspire to be a successful poet. I would like to have my poems published and recorded. I would like also to teach others about poetry and how to express themselves through poetry. I would like to be able to help change the world for the good of all man kind. I would like to help those that are suffering , sick , the poor and the hungry. As a poet I've learnt to release my feelings and tap into my emotions to let out all the feelings that i posses. Poetry helps me to free my mind and relate to others. As a poet I am able to deliver messages to my readers as well as to touch their hearts and make them connect with what they are reading. Each time someone comments on my poems, it makes me feel humble as well as reminds me of how talented and blessed i am. In conclusion, I hope that others can learn from my life experience, strive for excellence and never give up when the going gets tough. Life is what you make of it, grasp every opportunity, there are a lot of challenges ahead of you but put God first he will help you in any situation. I Realli like this. Dillon Ollvierre is a very Good friend of mine. He doesnt know how to give up.He always Motivates you and give u gud advice. Dillon has so much talent and he uses it. He just sits by himself,listens music and jus focus on what he is writing. I am very proud of what he has accomplished these passed years. Dillon I wanna let u kno that " NO DREAM IS TO BIG, THE SKY IT YOUR LIMIT". Reach for your dreams D. Ray will always be here to support u. God Bless u.. AAFLYD. Dillon is very talented the memories poem really kept me looking forward to a next line. I just want to say that i hope that his dream will come through and i wish him all the best.